This is first of my crazy soapy experiments I started a few weeks ago… I decided to see, what happens, if I simply saponify the whipping cream – nothing else! 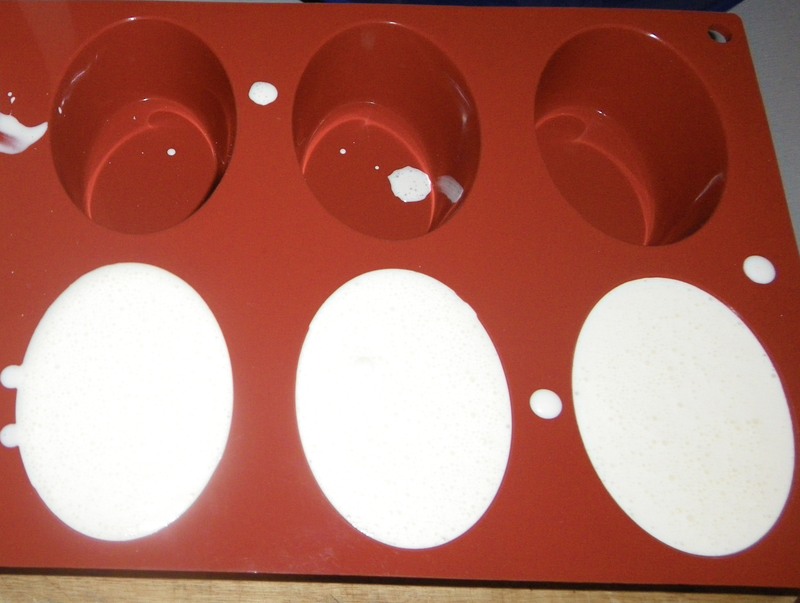 I guess I had this idea somewhere between trying to find a recipe for normal people that just want to start soapmaking without having to order special oils and making my second batch of the avocado soap with cream. It is fairly easy – the fat proportion is 35% of the weight, therefore SAP (saponification) value can be easily calculated – 0.35*weight of whipping cream is the amount of milk fat that should be saponified. I did not add the 42g of water as calculated by Soapcalc, because the remaining 312 – 109 = 203g of whipping cream consists of water, some proteins and some milk sugar. 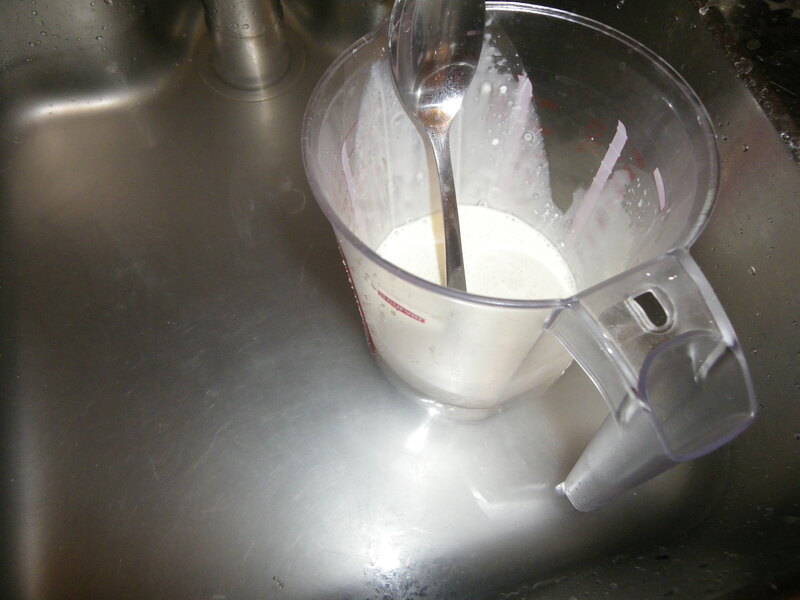 1) I dissolved lye in the whipping cream – I put the jar in cold water, but to my surprise there was no strong change of color. It smelled a lot of ammonia, as the lye decomposes milk proteins. 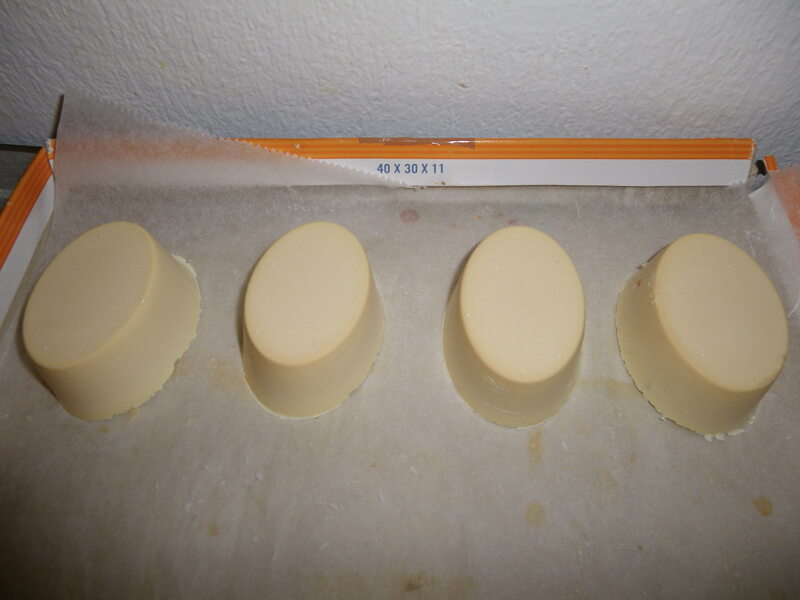 3) Unmolded 12 hours later and this is how they look 12 hours after unmolding. 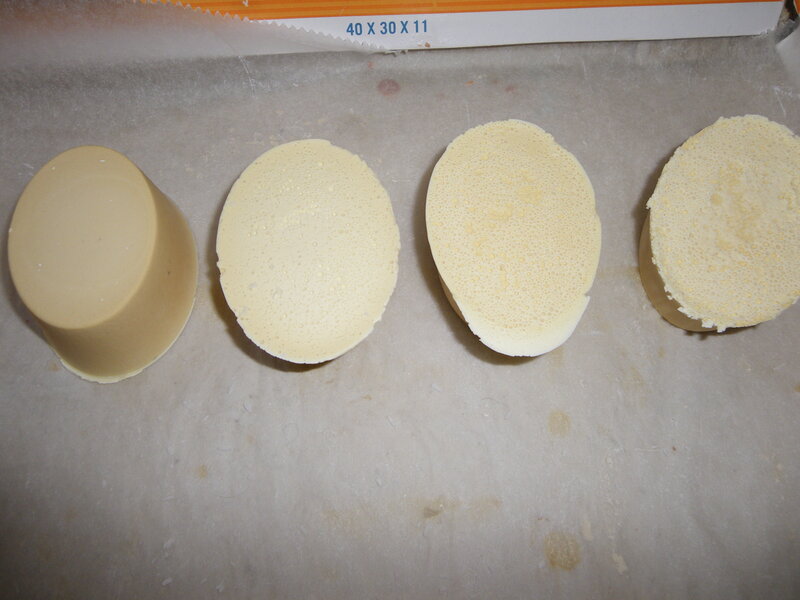 Compare the color – the nice white started to get yellow very fast. To my surprise the soap came up solid, although a little gummy. It shrinked a lot over time – see the image below – on the left is another regular soap, but from the same mold. 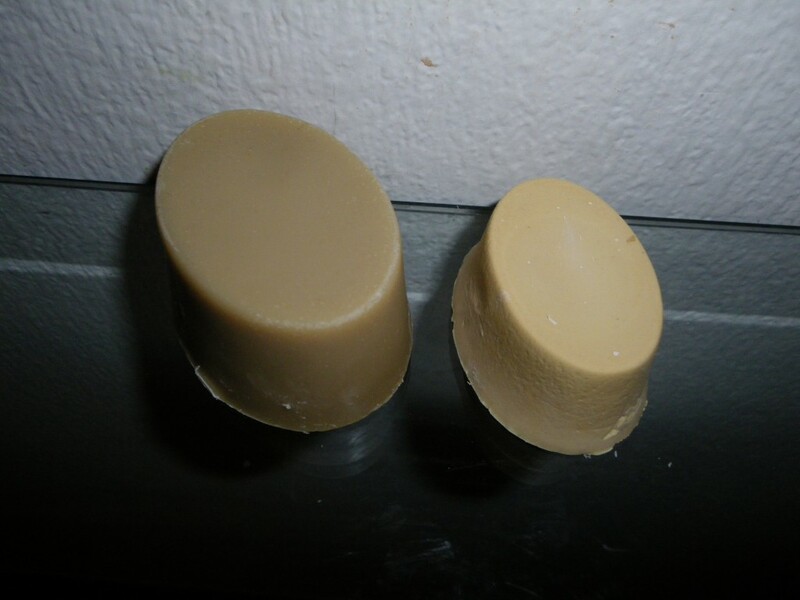 On the right the soap after 2 months and half. The difference of weight was 50g (soap on left 87g, soap on right 37g). The whipped cream soap has thus lost 50g at least. This was expected – there was a substantial amount of water. 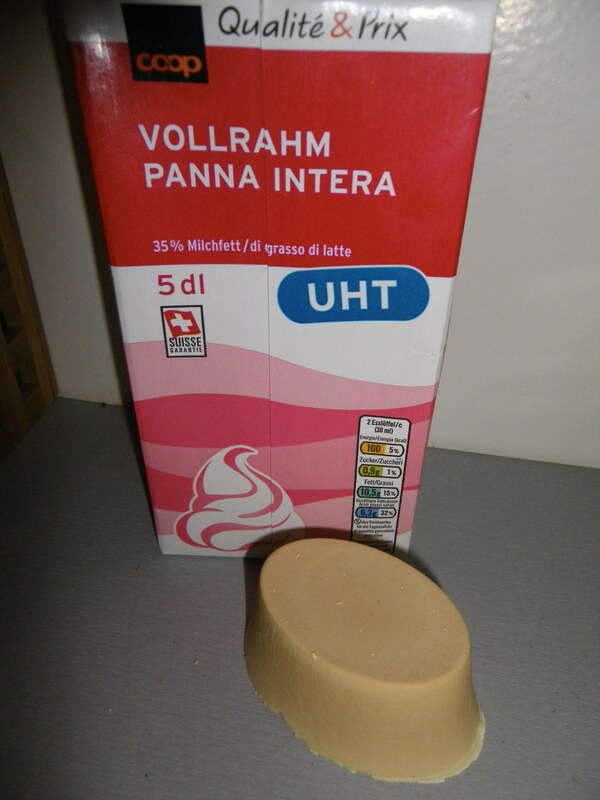 The soap also started to smell a bit like old butter and this smell mixed with the added fragrance, so it was not that unpleasant, but still suspiciously bizarre. It did not get worse within next few weeks. The soap had very, very luxurious rich and creamy lather. 2) The maximal percentage in the context of whipping cream milk fats getting rancid fast is to be determined. However, I think it can be a good replacement for butter – if you tried to add some in your recipe – which is more expensive. … any other ideas? Do you have similar experience? I would love to hear your opinion in the comments below! 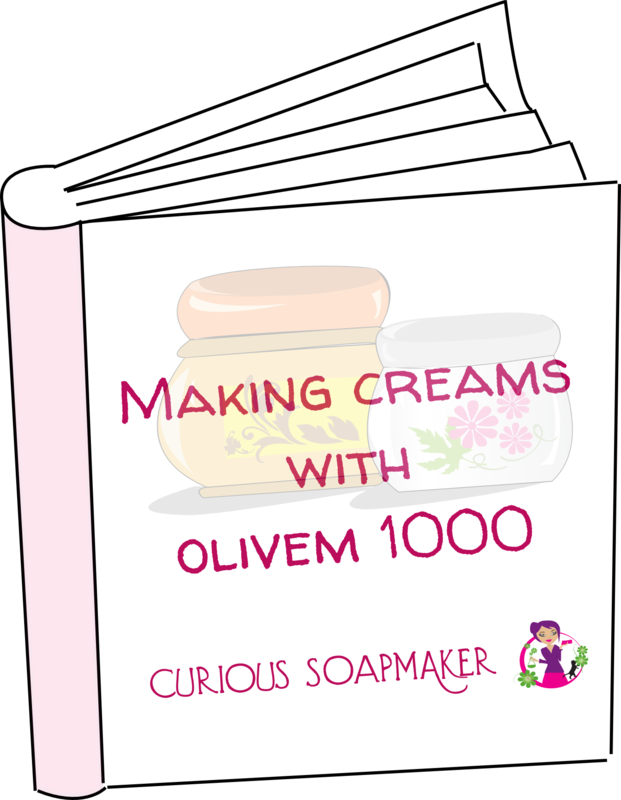 This entry was posted by evik on January 25, 2013 at 23:38, and is filed under crazy soapy ideas, My soap experiments, soap recipes, soapmaking. Follow any responses to this post through RSS 2.0.You can leave a response or trackback from your own site. What an interesting idea! I would have never thought to make soap with just whipping cream. Glad to have found this site. I love experimenting with soaps, and it’s great to know someone else is as crazy as I am. 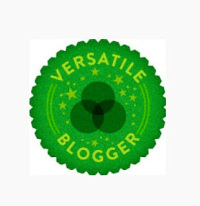 Hi Suzanne 🙂 I would love to hear about your experiments, feel free to share your blog. I love the idea of making such a soap, too bad though that the outcome isn’t that spectacular. Do you think coconut cream (instead of whipping cream) would also be worth a try? I have been trying to figure out how to saponify milks on their own for some time, I cannot believe I haven’t stumbled on this sooner! I feel confident in trying this now, thanks for sharing!